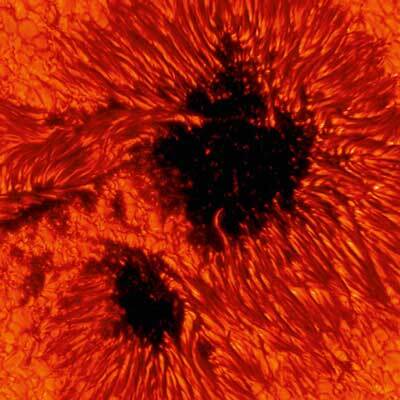 (Nanowerk News) Even the ancient Chinese saw them: dark spots on the Sun. Sunspots reveal impressive details in the telescope. And they represent the key to the activity of our star, its seething and boiling. For a long time, the scientists didn't know what this phenomenon meant. “Be calm my son and trust in God. I assure you, the spots are nothing more than flaws in your lenses.” The Jesuit priest Christoph Scheiner (1573 to 1650) from Ingolstadt found himself in a quandary when he read the lines penned by his Provincial Superior: had God not created the Sun as a pure and flawless light? On the other hand, Scheiner knew that the black regions on the star were anything but flaws in his telescope. His contemporaries, such as Galileo Galilei and Johannes Fabricius, also observed them in the early 17th century. And even ancient Chinese chronicles report on the sunspots, which are occasionally visible with the naked eye. What is this phenomenon all about? The Sun does not have a solid shell. What astronomers refer to as the surface, is a layer, only around 400 kilometres thick, from which the light visible to us originates: the photosphere. The entire Sun's orb has enormous dimensions. At a diameter of 1.39 million kilometres, Earth would fit into it 1.3 million times. And at 2,000 quadrillion tonnes (a two followed by 27 zeros! ), the Sun has 330,000 times the mass of our planet – and yet, compared to many other stars, it is a dwarf. The sunspots appear to float in the photosphere like black islands. As early as the 17th century, researchers recognized that at least the larger of them possessed a dark core, the umbra (from the Latin: shadow). This umbra is generally surrounded by a paler semi-shadow, the penumbra. The majority of sunspots are larger than Earth; some spot groups reach an extent of 300,000 kilometres, which corresponds to two-thirds of the distance between the Earth and the Moon. During the 18th century, even serious scientists believed that the dark spots represented holes in the Sun's atmosphere, allowing a view to the underlying, solid surface inhabited by alien beings. Later, however, researchers determined the temperature of the photosphere to be 5,500 degrees Celsius, and that of the umbra at 4,000 degrees Celsius. This difference means the spots appear considerably darker, almost black, in contrast to the undisturbed photosphere. But why are they cooler? The key to the spots lies beneath the skin, so to speak. The Sun is a gas balloon, in the centre of which is a fusion reactor, constantly converting hydrogen to helium at temperatures around 15 million degrees. Here, the solar power station produces 380 sextillion kilowatts of power every hour. Two mechanisms transport it to the surface: radiation and convection. In the outer convection zone – not even a quarter of the Sun's radius – hot plasma bubbles climb to the photosphere at an average speed of 3,000 kilometres per hour, cool off and sink back down a few minutes later. This constant bubbling and boiling lends the photosphere a grainy structure. The individual grains, referred to as granules, have diameters up to 1,500 kilometres. On images of the Sun, this granulation resembles a regular pattern of corn grains. But not only the photosphere is moving. Hot material also circulates in the Sun's interior. This plasma – a gas comprising ions and electrons, either partially or entirely – is electrically conductive. The Sun possesses a magnetic field originating deep in its interior. The mechanism involved in producing the sunspots is still a matter of discussion: one scenario assumes that plasma rises by convection from a depth of approximately 200,000 kilometres and draws the magnetic field lines with it like a teaspoon dipped in honey and then raised to the mouth. At those locations where the bundled field lines penetrate the surface, the strong magnetic fields prevent additional hot plasma from rising: a sunspot is born. The photo shows two such sunspots. Johann Hirzberger from the Max Planck Institute for Solar System Research recorded it using the Swedish Solar Telescope (SST) at the Roque de los Muchachos observatory on La Palma. With an aperture of 98 centimetres, the SST is the world's second largest refracting telescope. The telescope tube is evacuated to prevent air turbulence, which would impair its resolving power. In addition, adaptive optics compensate for the constant flicker caused by the Earth's atmosphere. To achieve this, the instrument analyses the Sun's image 1000 times per second and adapts the optics correspondingly. In this way, the Swedish Solar Telescope delivers high-definition images. At the edges of the sunspots in the image, brighter, filamentary structures can be seen. These should in fact also appear dark, because the magnetic fields should be strong enough to hinder energy replenishment and cool the region. Hirzberger and the research team he heads have already demonstrated that the local magnetic field is weakened in places. The plasma circulates and generates extended luminous structures, which appear to rotate around their axes. Spots often occur in groups. The number is a measure of solar activity – and is not always constant: every eleven years, on average, the Sun suffers from “chicken pox”, as it were. Then, a particularly large number of sunspots cover its glaring face. The last solar maximum was predicted for May 2013. However, there were only a few sunspots at that time; the Sun currently appears to be faltering slightly.